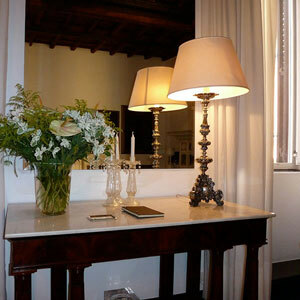 The owner has furnished this apartment with many exceptional antiques to make it the epitome of Italian classical taste. Moda II feels like a home the moment you walk over the threshold. Combine this feeling with the ideal location, and it becomes the perfect home for the discerning traveler who wants to explore Rome in a truly relaxed way and feel like a native while doing so. On the right side of the entrance hallway, two doors open into a very well appointed living room with a dining table. large fireplace and a single sofa bed. From there one door leads to the fully equipped kitchen and a breakfast nook with table seating 4. Further down the hall, a double bedroom suite with a small balcony and en suite bathroom. Left of the entrance hallway is Twin bedroom that can be joined as a King bed and an en suite bathroom. Visa or MasterCard will secure damage deposit on arrival Credit card required for security deposit.